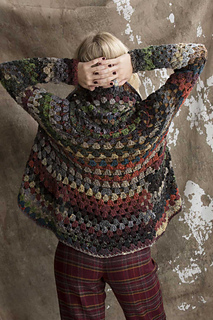 Worked in one continuous piece, King’s double-crochet shell-patterned cardigan fragments Noro Taiyo colorway #21 into a mandalic kaleidoscope of rust, mallard, silver and black. Increases are worked at each corner to the outer edge, where rapid increases shape the swingy shawl collar. The narrow sleeves are crocheted down from the armholes. April 19, 2016: The PDF version of the pattern now includes schematics. The print magazine does not. This garment is part of the Get Squared™ program.